Something about the weeks starting with a 3 is really hitting home for me now. My due date is in July. That seems far enough away. Really, it’s 2. 5 MONTHS away. But when I think of the fact that I am now in single digit weeks my heart starts to pound and I realize that the movement inside my body is IN FACT a baby and not just gas. There is absolutely nothing about this pregnancy that is the same as the first one. How does that work!? I mean it’s amazing really, how different it is and I know I have already said it, but it’s so true. I feel like a cloud has lifted in this 3rd trimester. 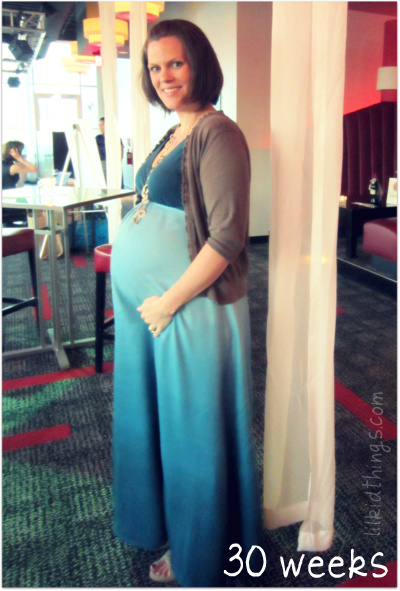 Typically, the 2nd trimester hosts the glory days full of energy and shopping and excitement. But I have to say, I was pretty miserable. My hormones were nuts and I felt bad a LOT of the time. Now that I am soundly in home stretch territory, I feel much lighter! Slower, but lighter nonetheless. Physically, I still feel pretty good and my emotions are really getting back under control. Yes, it is good. Last week I had a terrible 24 hour stomach bug. I don’t know if it was a virus or something I ate, but I can tell you this, Gyros and greek salad shall not touch my lips again until after the baby arrives. Sad. I am now in the land of OB appointments every 2 weeks. I don’t mind this part. It tells me that we really are rounding the final corner to the finish line! Baby’s heartbeat has consistently been strong, he is growing normally and I have passed my glucose tests! They had me test twice because of Oscar’s size to be sure I wasn’t a closet gestational diabetic. I am thankful that I passed because those starburst jellybeans didn’t eat themselves…. At 30 weeks, I have gained about 17lbs. Oscar was born at 39 weeks! The clock is ticking friends. Let’s do this! GORGEOUS MAMA!!!! Love the dress, love you! What a gorgeous dress and a beautiful mother inside it! As different as your pregnancies are, your children may be, too. Variety is the spice of life, right? 🙂 Wishing you a comfortable third trimester with continued lightness and growing excitement. You look so cute. I love the new dress! Man, wish I looked so lovely at 30 weeks! I had a stomach bug with my first at about the same point of my pregnany- on my 21st birthday. Yes, spent that evening in the bathroom, but didn’t get to have any of the drinking fun beforehand 🙁 I haven’t eaten a caesar salad since.